Base of very high leaning pole at Gitex on Nass River. One watercolour, section of monumental pole, Nass River. One painting of monumental pole on 3 joined pieces of paper. One watercolour of top of monumental pole, Nass River. 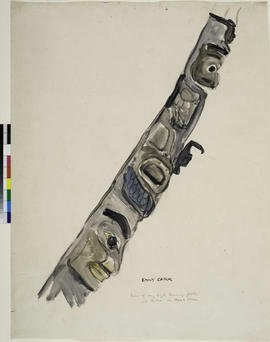 One watercolour of the middle section of a monumental pole.